As weather strengthens across the globe, natural grass becomes very prone to the harsh weather. Droughts, extreme heat or too much rain can have severe effects on the health of your lawn. These can be costly and timely to repair. Thus, people are looking for options to replace their lawns. Whether to save money, time or planet Earth, there is an answer. With the growing technology in the area of fake grass, artificial turf has become the popular product to replace lawns. From small yards to big sports fields, folks are making the switch. Many people, from your neighbor to NFL teams, have turned to the latest in man-made sod for their grass needs. Made to look and feel like real sod without the hassle of lawn care and impacts to the environment, artificial turf has never been more trendy. In the SF Bay Area, the premier artificial turf vendor is Watersavers Turf. We have a wide range of products for a range of needs. We are ready to outfit your home or field with the future of grass. The number of sports fields switching from grass to synthetic turf is growing. Two of the more common sports played on synthetic turf are football and soccer. Both of these are high impact sports. This means athletes often suffer from cuts and scrapes. These occur from tackles and hard contact with the ground. These surfaces may become places for bacteria to grow. Thus, athletes the world over are highly prone to staph infections caused by surface bacteria coming into contact with open wounds from physical sports. Methicillin-resistant Staphylococcus Aureus (MRSA) is a kind of staph bacteria. These microbes usually cause skin infections. What is serious about this bacterium is that it also resists common antibiotics. They are not able to combat MRSA. Per the findings of a Penn State study in 2008, MRSA can survive on synthetic turf fibers for days on indoor surfaces. While outdoor faux grass proved a harder breeding ground for the bacteria due to its warmer surface temp. The safety of athletes from staph infections and other ailments caused by bacteria is serious. People’s health can be at risk, and a team’s success can be altered if players are missing from action due to illness. Although, according to Penn State, the bacteria are almost undetectable after 3 hours on turf located outside, UV light technology is currently being used on fake grass fields to quickly neutralize MRSA. Scientists have found a way to fight the staph causing MRSA bacteria at the source. This is done through harnessing the power of the C-band (UVC), a shorter wavelength of UV light that is known to kill germs. Even small doses of UVC works to break up the nucleic acids in bacteria, leaving them innocuous where they lay. This high-tech treatment is now being used by several NFL teams as well as schools, and other sports facilities. More teams are looking into UVC use every day. The sports world has clearly taken notice. Several companies are even making a name for themselves in this business. They are right now effectively marketing UV light products to major sports leagues around the world. While this works well to sterilize turf, this tech does not work on real sod. 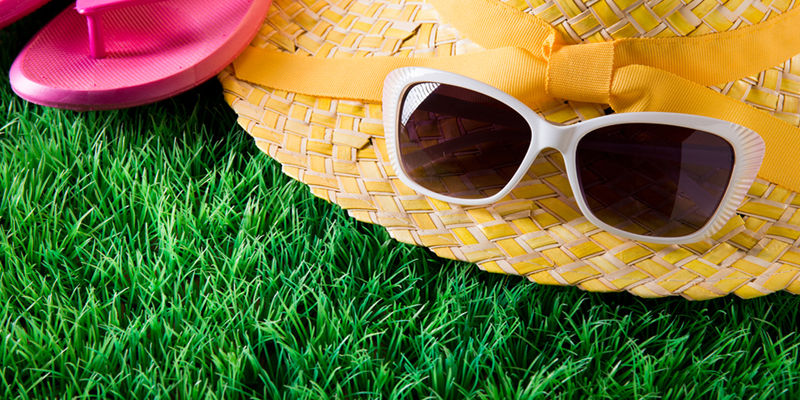 By nature, grass does not absorb UV rays and heat like synthetic sod. Meaning, bacteria are more likely to survive on live grass without the benefit of faux or UV light technology to remove the health risks. This makes synthetic turf the healthy choice. Faux grass is a safe, eco and budget-friendly choice. Contact Watersavers Turf today to help outfit your lawn or field with faux grass. We carry over 60 types of top-quality products that range in color, face weights, and purpose. Call us at 844-974-8873 to speak with an expert. You can also visit one of our seven locations to touch and feel our product. Our reps are standing by to educate you on the benefits man-made grass has over the real lawn. You can also reach us 24 X 7 on our website by requesting a free online quote. And of course, 1’ x 1’ samples are always free!